Detailed plans have been revealed for the intended refurbishment of Blaby District Council’s two leisure centres. From April 2019, the Pavilion Leisure Centre in Huncote and Enderby Leisure Centre will be managed and operated by Everyone Active, and now artist impressions of improvements to be made to the centres have been unveiled to the public. More than £4.5m is being invested by the leisure operator and Blaby District Council to modernise facilities at Enderby Leisure Centre and the Pavilion Leisure Centre, which will also receive a high-quality renovation. 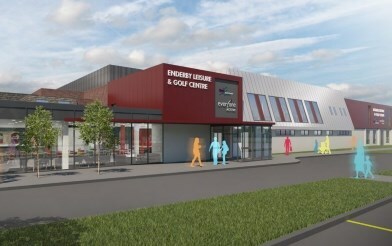 Phase one of the renovation at Enderby Leisure Centre will start in May 2019 and is expected to be completed in the Autumn. It will see an extension of the existing gym and new fitness equipment installed, along with a new group cycling studio and state-of-the-art spa area. The sports hall and gym changing facilities are to be refurbished, and carpet in the bowls hall replaced. Phase two will commence after the completion of phase one, and will consist of an expanded and modernised cafe, plus a refurbishment of the swimming pool and swim changing facilities. In addition, brand new 3G football pitches will be installed. Updates to Pavilion Leisure Centre include a state-of-the-art 60-station gym over two levels, a refreshed studio, refurbished changing rooms and redecoration of the existing fitness and social suite. Work will commence from Summer 2019. An exhibition showcasing artist impressions of the new facilities and renovation plans will be displayed at the Blaby District Council main office in Narborough before being moved to Enderby Leisure Centre on 16th March. John Richardson, Strategic Director at Blaby District Council, said: “We’re extremely excited to see these plans and it highlights our commitment to using leisure to improving resident’s health. James Naylor, Everyone Active Contract Manager, said: “We’re thrilled to be involved in such a positive investment in Blaby’s leisure facilities which will ultimately benefit the local community on their health and fitness journey.